The H. L. Hunley is unique in that she was essentially a time capsule, holding all the contents from the night she sank over a century ago. In addition to the interest of holding treasures from our nation’s past, the submarine is also an active archaeological site, where scientists are collecting clues. They hope to use this information to one day discover why the Hunley vanished after becoming the world’s first successful combat submarine. For these reasons and for the tremendous significance the Hunley has in maritime history, opening the submarine for excavation was not something the archaeological team took lightly. After many months of planning, they came up with a plan to safely excavate the submarine. Scientists initially concentrated on the central compartment of the sub, where they believed the eight-man crew would still be located. Throughout the entire excavation process, the team painstakingly collected the evidence the submarine held to explain why she mysteriously vanished. Excavating the interior provided a wealth of information about the operation of the vessel and the men who served onboard. Areas of damage and other crucial information were uncovered. Still, even with an extensive list of uncovered evidence, the mystery of the Hunley’s final hours linger. 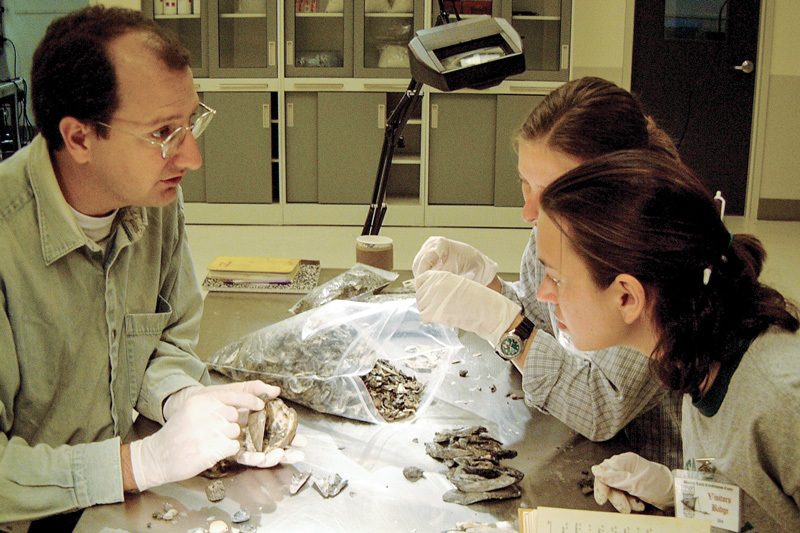 Using all the tools at their disposal, the team continues their investigation to find the truth about what happened to the Hunley and her crew. In order to safely enter the submarine, a careful preliminary study and mapping of the exterior was completed. Archaeologists scanned the entire outside prior to making any changes to the vessel. The scan produced an exact model accurate to within 2 millimeters. Using this digital model of the Hunley, researchers were even able to zoom in and measure the heights of barnacles on the submarine. 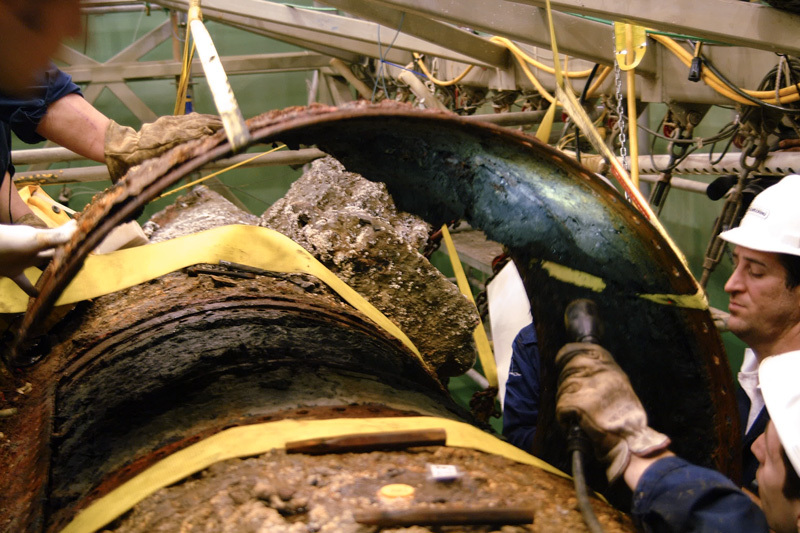 This enabled the team to ascertain the proper access points to conduct a safe scientific excavation without damaging the Hunley and the artifacts she held within. First, they were able to have a “test run” through an existing hole in the aft starboard side of the tank. 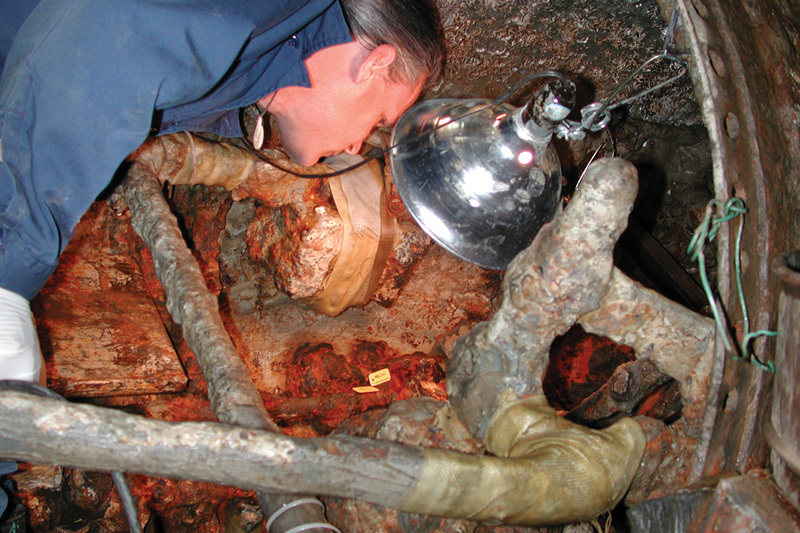 This provided a limited, but direct access to the interior of the submarine, and enabled archaeologists to get an overall assessment of the condition and nature of the hull plates, ballast tank, backing plates and rivets, and the location of ship machinery such as the propeller shaft and steering controls. This phase revealed how the Hunley’s iron plates were fastened, how they could be removed and how the sediment had filled the submarine. Removing the first hull plate from the center section of the submarine was a major challenge with over 100 rivets drilled out to loosen the plate. A series of hull plates were removed to gain sufficient access into the submarine’s interior. 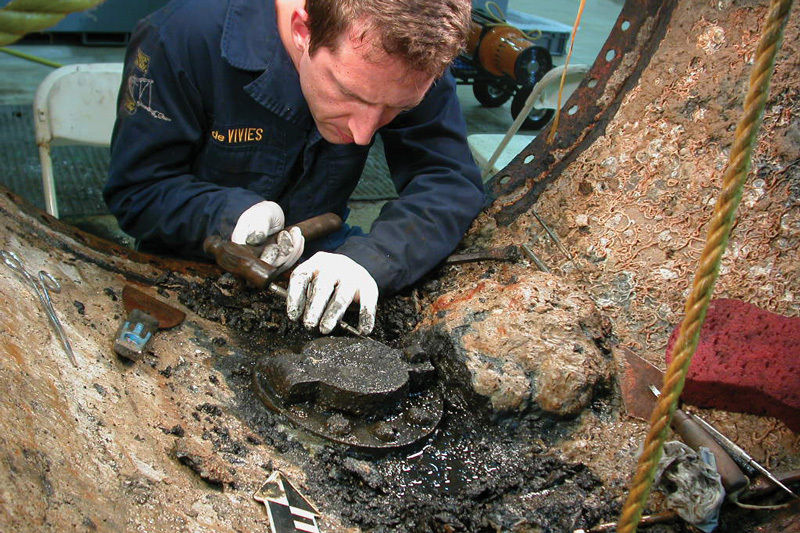 Their removal enabled the team to retrieve the remains of the crew and any artifacts associated with them, as well as learn more about the operation of the submarine. An important focus during this phase, and the entire excavation, was to maintain the integrity of the submarine’s construction. Therefore, scientists tried to remove as few plates as possible. The sediments inside the central compartment and the accessible portions of the ballast tank areas were excavated by hand using a combination of trowels, metal and wood scrapers, and spatulas. 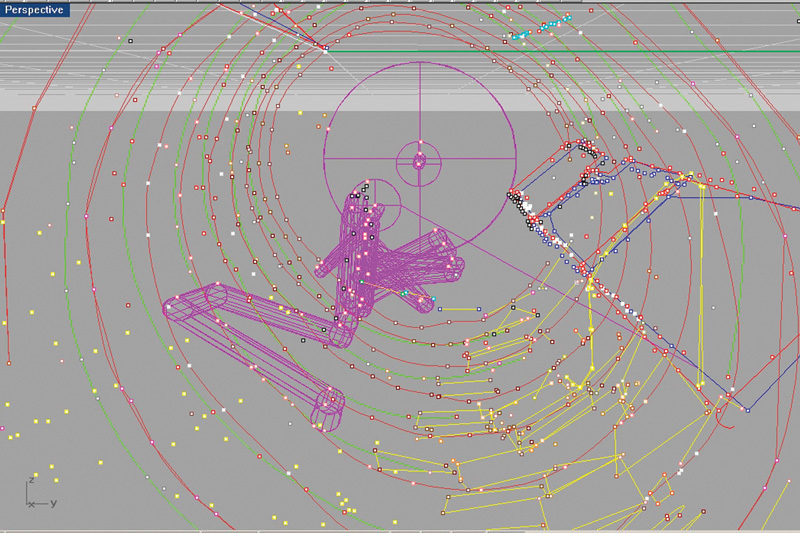 After screening, all the sediments were collected and handled in a respectful and careful fashion.